Run Time: Approx. 134 Mins. Using a multiple-camera setup, Kernie Cam Productions produced a DVD edition for Northern Lehigh Little Theater's 2012 production of the classic musical "Gypsy." Featuring custom opening and end title graphics, the show was edited in Final Cut Pro, utilizing several different camera angles to capture the best angles and performances from the young actors. Released shortly after the show's theatrical run, the DVD includes the full theatrical experience, along with scene selection capability and animated interactive menus. The package design was created in Adobe Photoshop CS5 and incorporates elements from a promotional poster designed and illustrated by Northern Lehigh High School student Alexandra Abruzzi. PLEASE NOTE: This item is NOT available for purchase. Due to contractual stipulations, licensing restrictions, and privacy concerns regarding the students, Kernie Cam Productions is not permitted to offer copies of Northern Lehigh High School's performance to anyone outside of the cast and crew of the show. 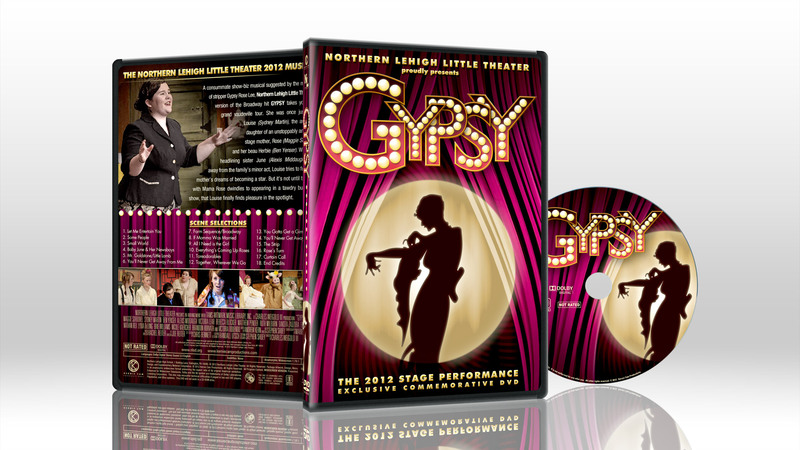 Below is the complete list of bonus content for the DVD release of "Gypsy."